Happy Fall, ya’ll! 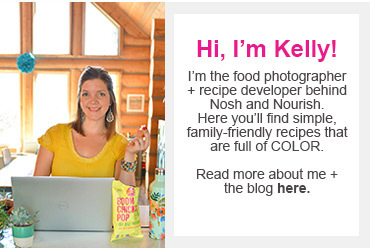 It’s @lunchesandlittles here with my first official fall recipe for Nosh & Nourish (yay!). I was busy in the kitchen with this one earlier this week, and honestly – it was hard for me to wait even just a few days to share, because it is that good. Now when it comes to seasons, I love them all (for different reasons), but fall and winter are among my personal faves. I love sweater weather, big boots, going to the pumpkin patches with my family, enjoying hayrides, and apple cider – oh yes, I’ll take two cups. Or if cocktails are your thing, try Kelly's apple cider sangria! When it comes to fall food… all of the expected flavors come to mind, like pumpkin and apple. Yum! But, fall food goes far beyond those familiar flavors. Squash, cranberries, Brussels sprouts, and more are some of the not-so-expected flavors that we love to eat more of this time of year. And today I have a dish that is going to highlight a few of those, and many more. Yes, today I am sharing a dish that is perfect for that transition between summer and fall. This Honey Lemon Chicken w/ Loaded Harvest Couscous is packed full of so many flavors, and boasts all sorts of fall goodness, like butternut squash for starters. 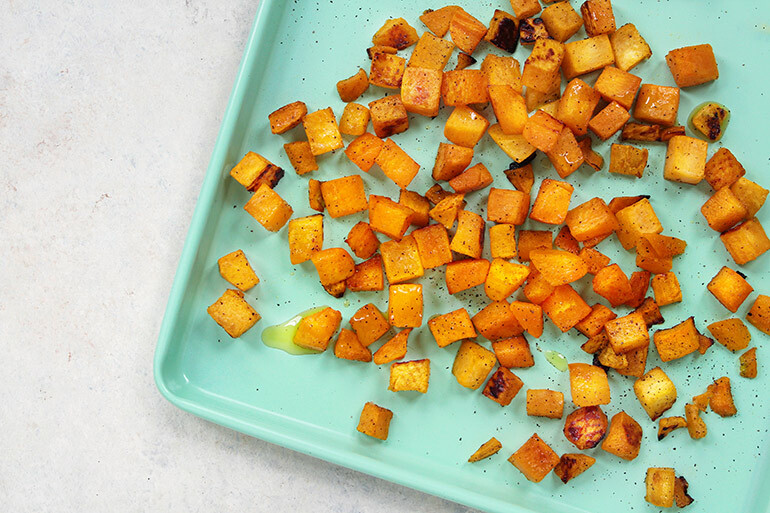 Are you a roasted butternut squash fan? We love it here, and eat it in many dishes, like this Chicken and Butternut Squash Dinner w/ Maple Dijon Sauce I shared earlier in the month. Roasted butternut squash is a favorite veggie with all three of our kiddos too, so that is a major mom win! For this recipe, I start off with cubed butternut squash (shown above), tossed with olive oil, fresh squeezed lemon juice, a bit of honey and salt and pepper to taste. 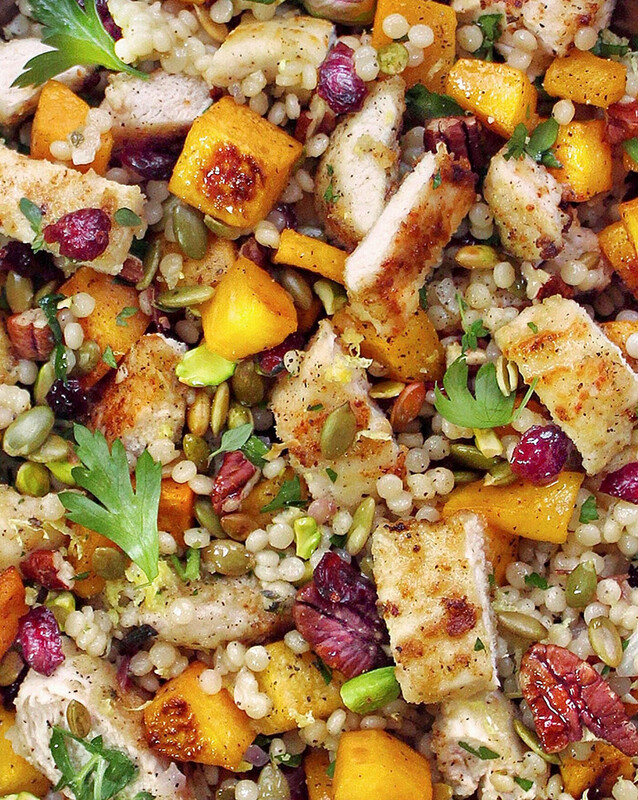 While the squash roasts up in the oven, you cook up some lightly coated skillet chicken and loaded couscous, and then combine all of that together with dried cranberries, pecans, pistachios, pepitas and parsley. Oh, and then you top that all off with some of the same honey/lemon/olive oil mixture that you roasted your squash in when you started out. 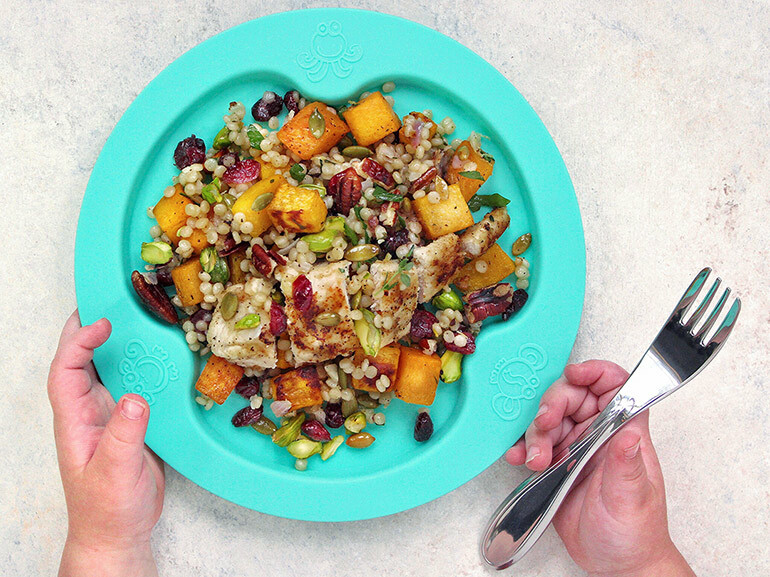 This dish is tasty, full of fall flavor and perfect for the whole family. See the full recipe below and be sure to let us know if you decide to make it. We would love to see! 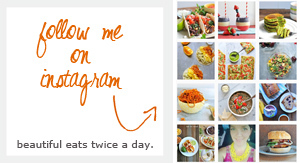 Just tag @lunchesandlitles and @noshandnourish in your post! Prep your ingredients: Cube butternut squash (or buy it pre-cubed and ready to go), grate zest from lemon and squeeze juice. Set aside. Coarsely chop parsley, and pistachios. Dice onion and garlic. Then remove thyme leaves from sprigs. Set all prepped ingredients aside. Place squash on a baking sheet. Then, in a small bowl whisk together the lemon juice, honey and only 1/4 cup olive oil. Pour a small amount of the honey/lemon mixture over the squash, tossing to coat. Sprinkle with salt and pepper as desired. Roast squash in oven for approximately 30 minutes, or until cooked through and tender. While squash is roasting, bring 1 cup water to a boil in a small saucepan. Add couscous, lemon zest, onion, garlic and cranberries. Mix together, then remove from heat and cover. Let stand approximately 5 minutes. While your loaded couscous is cooking, cook up your chicken: Start by dividing the remaining honey/lemon mixture in half. Pour half in a shallow dish. Set the other half aside. Then place flour or almond meal in a second shallow dish. Dip chicken tenders into honey/lemon mixture, then into the flour/almond meal mixture until well coated. Repeat until all tenders are coated. Discard any remaining honey/lemon mixture and flour. Next, heat a few drizzles of olive oil in a pan over medium-high heat. Place chicken tenders into pan and cook, flipping as necessary until cooked through (you will have to do this in batches). Once done set chicken aside and cover to keep warm. Finish couscous: When couscous is done, add squash, parsley, pistachios, thyme and pepitas. Toss to combine. To serve, slice/chop chicken and divide evenly with couscous between 4-5 bowls/plates. Top with pecans, and use remaining honey/lemon mixture as a vinaigrette as desired, to finish off your dish. Season with salt and pepper to taste.